Hi guys, hope you all had a good Monday. My Dad always say after Monday comes Friday, its just spelt in four different ways. 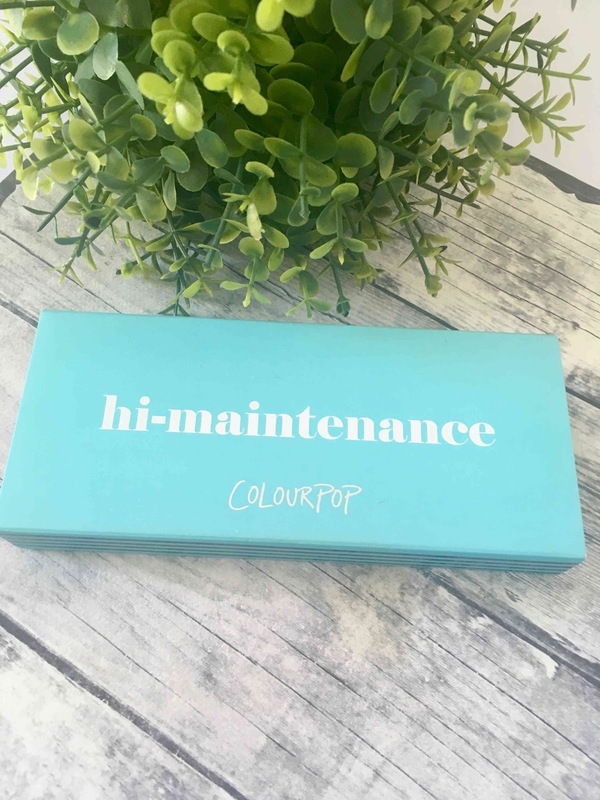 Today I will be sharing with you my thoughts on the hi-maitenance palette from Colourpop. They have recently launched pressed shadows and this was one of their first palette range. They have a whole lot of colors but had three palettes to start off with and this was my favorite one, it immediately grabbed my attention. Packaging : The palette comes in a sleeve that has its name and the company name on it. 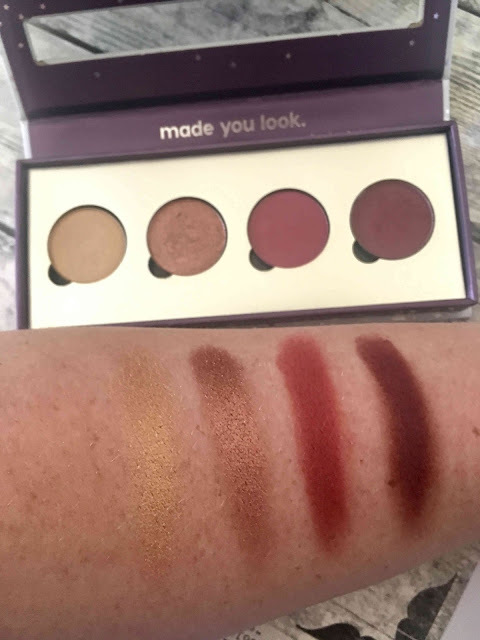 Real sleek, when you turn it over, it shows the palette name again, the names of the four shadows, that it's cruelty free and where its made as well as the ingredients. When you lift the pans out the palette, it has the names on the back and the palette is magnetic (the pans fitting into palette as well as the closure lip). When you take the palette out the sleeve you will see it's a beautiful white case with silver stars and a "peek through" window where you can see the color of the shadows inside. Now when you open the palette, the inside is a gorgeous purple color with more silver stars. Like I said before, the pans are magnetic and they have a tiny "nail hole" where you can pop them out to refill them. I love everything about this packaging except that the white gets dirty very easily. 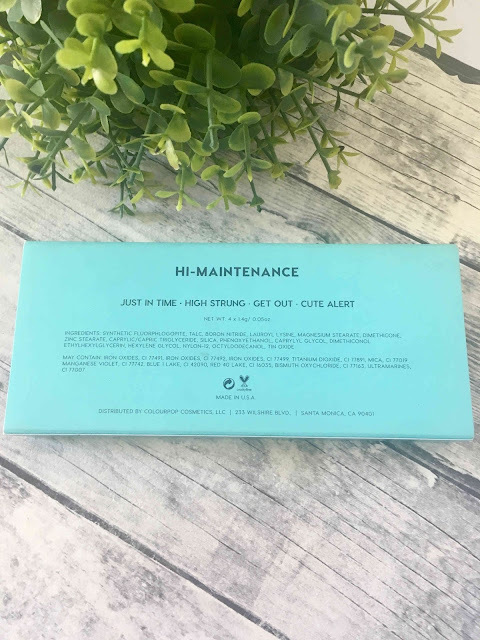 Staying power : Now if you have been following my blog for some time, you will be so tired of me going on and on and on about my oily lids. Needless to say if I do not prime and set my lids, no shadow, no matter what is in it or what the price is, it simply will not last more than 2 seconds. These however are true troopers. Last weekend I had a baby shower in the morning and I got ready at 8, wore my eyeshadow the whole day, touched up at night before we went out for the evening and when we got back well after midnight I was so impressed with my shadows still looking perfect. These powders are incredible and this palette is the star of my whole purchase. Infact, I loved it so much that I already ordered another and if I can just figure out this whole Aramex thing, it should arrive in the next day or two. Formula : These shadows are EXTREMELY pigmented and gorgeous. They last for ever on my lids and the colors work so well together in this palette. They do kick up a lot of powder, but dusting off the excess will fix that problem instantly. They almost blend themselves, that is how easy it is to work with them. I have also found that the color stays true and does not blend into some sort of watered down version of what is in the pan. The shimmery ones do not have chucks of glitter in them, they are almost like a foiled shadow and the mattes is not chalky or patchy at all. I will almost compare these shadows to my beloved Inglot freedom shadow system. 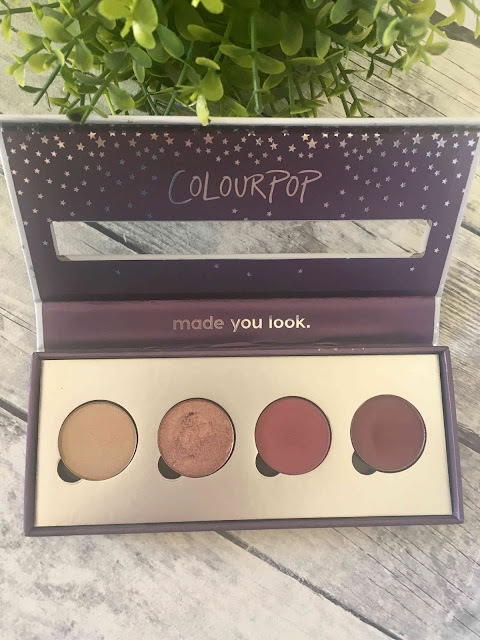 Color Range, Where to find and Pricing : ColourPop has got so many shades in the pressed shadows (as well as their super shock formula, not pressed powders) and they keep on releasing new colors. They have just release a Spring collection in three phases. Phase three : Neutral browns monochromatic called Sand. You can order from their website and they have recently started shipping to South Africa or you can order through third party sellers here in South Africa. This is a stunning palette and it performs very well. ColourPop is a very affordable brand and their quality is outstanding. Unfortunately courier fees and import taxes drives the prices up the roof, but even with that I feel that these shadows are worth it! 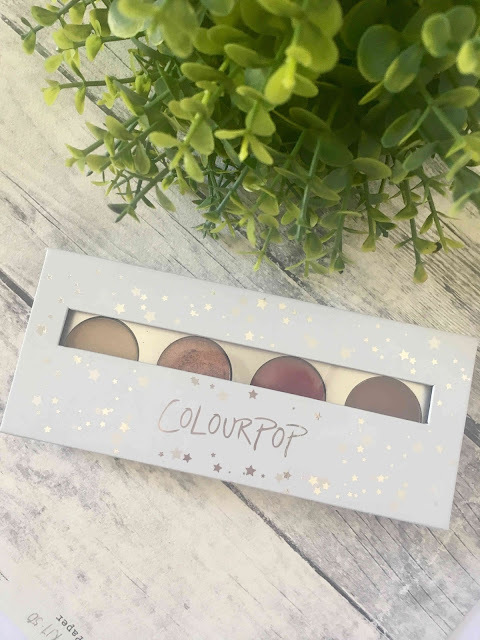 Leave a comment if you would like to order something from ColourPop and what is on your current wishlist.